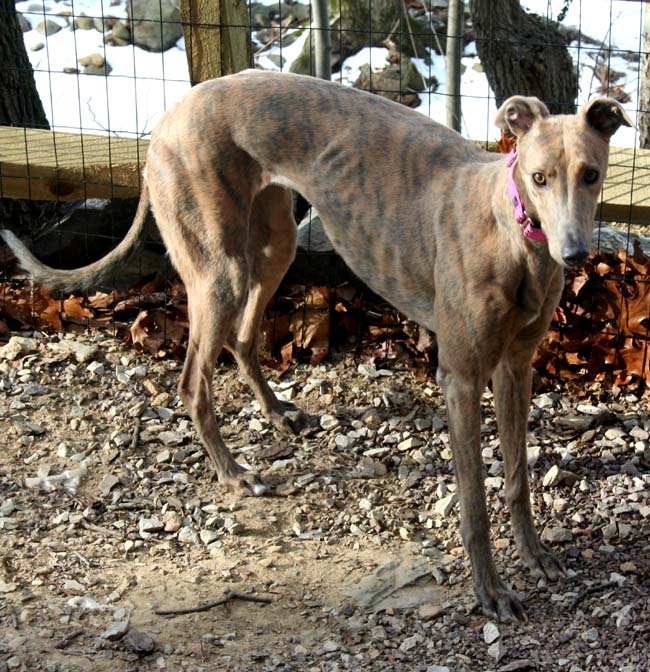 We at FFGR, Inc. are devastated to report that a very young greyhound was lost recently to an unknown cause. Rose was only three years old. She got sick and within a day or two she was gone. She collapsed in her family’s home and the vet could not revive her. Jamie and Brian Nichter adopted Rose in January of this year. Jamie and her family have another greyhound and Rose was the second hound they adopted from our group. Their children (and the rest of the family) are very sad and upset. Rose was a gorgeous blue brindle girl that loved everyone. In fact, when we placed her on our Available Dogs page, we got numerous inquiries about her and a lot of people wanted to adopt her. Jamie contacted us about adopting a second greyhound but never asked for a certain dog. They asked us to find them a dog that would fit into their family. We thought that they deserved to have Rose because she was so special. We always are sad to learn of a greyhound passing on to the Rainbow Bridge but we are especially saddened to learn of such a young dog losing her life so soon. We know that Rose got the chance for a wonderful and most loving home. She was truly a lucky dog. Even though her time with the Nichters was cut off way too short, Rose had the home that we at FFGR, Inc. always hope for when we place a greyhound. Run free sweet Rose; you have lots of friends at the Bridge.